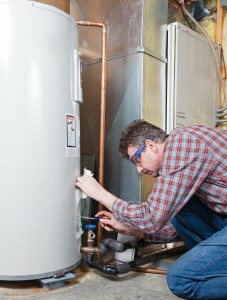 You may have lived in an apartment where you did not have to service or replace a hot water heater. However, renting or buying a property gives you a chance to become familiar with this basic appliance. As a huge vertical tank, hot water heaters store and warm water for instant use around the home, from washing dishes to showering. If you have an old or broken unit, it may be necessary to replace it. Plumbing 4 Less can make your installation a smooth and rapid process to return your home back to normal. If you are in need of any plumbing services in Atlanta call us now at 678-820-4747 and schedule an appointment, or click here to have our staff reach out to you! How Does Plumbing 4 Less Handle the Installation? Your hot water heater needs to be installed with a cold water supply pipe and plumbing that moves the hot water into the household’s piping. We will also need to connect an energy source to heat the water, either natural gas or electricity. If there is a natural gas hookup, we take special care to turn off the supply and verify connections before any gas is turned on. Because of its weight, the heater is typically installed with at least two technicians. Although the tank is empty when installed, it still requires heavy lifting to place it correctly. If you desire, we can also place a pan under the new installation to catch any water that may leak. Any future cracks can allow water to drip out of the tank’s base. The pan will stop small leaks from damaging nearby drywall or floors. After your installation, your hot water heater is not a maintenance-free appliance. Although it works diligently for a decade or more, you must inspect it periodically. Drain the entire tank, using a garden hose directed at your street gutter, once a year. With the tank empty, you can evaluate the internal sacrificial anodes. These rods attract corrosion to prevent it from accumulating on the tank itself. Preventing emergencies is simply achieved by observing the tank each month. Evaluate the tank’s base. If you see any bulges, cracks or excessive corrosion, contact Plumbing 4 Less immediately. The tank may be damaged to the point that it starts leaking water. If the damage looks severe, turn off the cold water supply and drain the tank. You will prevent a major flood with this strategy. Avoid touching the natural gas connection, if equipped. If the connection is loosened, you can cause an explosion from accumulated gas in the area. Any issues surrounding the gas or electrical connections on your tank should be evaluated by Plumbing 4 Less. Contact Plumbing 4 Less now at 678-820-4747. With our qualified team of technicians, your next water heater installation should be quick and simple. We will even discard an old water heater for you. Plumbing 4 Less wants you to have a safe and reliable hot water source. With proper care and observation, the tanks should work seamlessly everyday.